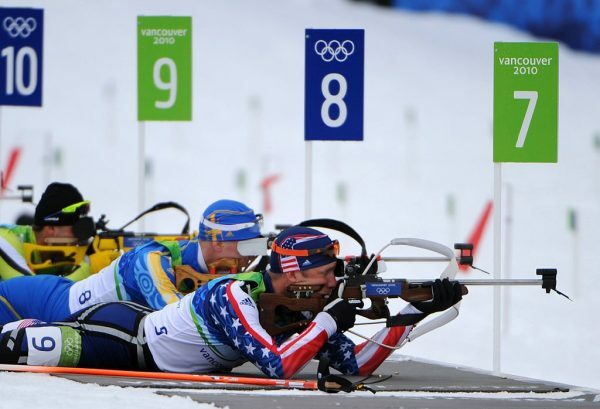 There is one sport that every four years at the Winter Olympics has spectators scratching their heads and that’s biathlon, the sport that combines cross-country skiing and shooting a rifle. At first, you might be perplexed. Why on earth are these two things related? But as any hunter can tell you, especially one that ventures into the back country during the winter, cross-country skiing and rifle skills are actually pretty important. These days, winter hunters prefer to take a snow mobile into the backcountry. But those machines come with one main drawback and that’s noise. If you want to get up close to your prey in the winter time, you’re going to need to be quiet. Cross-country skiing, while quiet, is a much easier way to cover ground than on snow shoes, which can be slow and grueling. Being able to ski and shoot a rifle, was not only valuable traits for successful hunters, but successful warriors of the day as well. Just about as soon as cross-country skiing was invented, men were figuring out ways to use the sport to shoot something. The first known biathlon competitions took place during the 18th century between the Swedish and Norway militaries, which realized these two traits were highly sought after among soldiers. The first modern style biathlon occurred in 1924 with a competition hosted by the Norwegian military. By 1924 a version of the biathlon known as ski patrol was introduced to the Olympics. The sport was first included in its modern at the Winter Olympics in 1960. At the 2018 Winter Olympics, athletes competed in 12 separate events between the men and women including individual and relay competitions. Today’s biathlon features a unique twist. As a penalty for not hitting the target, competitors are required to ski an additional section of the course. Making news at the 2018 games in Pyongchang has been the Darya Domracheva from Belarus, who became the first female biathlete to win four gold medals. The biathlete won her final medal during the relay competition, one of the most exciting disciplines that often has lead changes throughout the race.